李莉, 王雪, 菅玉霞, 刘元文, 高凤祥, 潘雷, 郭文, 胡发文. 不同月龄大泷六线鱼形态性状与体质量的相关性及通径分析[J]. 上海海洋大学学报, 2019, 28(1): 58-66. LI Li, WANG Xue, JIAN Yuxia, LIU Yuanwen, GAO Fengxiang, PAN Lei, GUO Wen, HU Fawen. Correlation and path analysis between morphological traits and body mass of Hexagrammos otakii at different months of age[J]. Journal of Shanghai Ocean University, 2019, 28(1): 58-66. 成庆泰. 中国经济动物志(海产鱼类)[M]. 北京: 科学出版社, 1962: 135-137. CHENG Q T. Animal spirits in China (Marine fish)[M]. Beijing: Science Press, 1962: 135-137. 刘蝉馨. 辽宁动物志:鱼类[M]. 沈阳: 辽宁科学技术出版社, 1987. LIU C X. Liaoning zoology (fish)[M]. Shenyang: Liaoning Science and Technology Press, 1987. 冯昭信, 韩华. 大泷六线鱼资源合理利用的研究[J]. 大连水产学院学报, 1998, 13(2): 24-28. FENG Z X, HAN H. Rational utilization of Hexagrammos otakii resources[J]. Journal of Dalian Fisheries University, 1998, 13(2): 24-28. 吴立新, 秦克静, 姜志强, 等. 大泷六线鱼(Hexagrammos otakii)人工育苗初步试验[J]. 海洋科学, 1996(4): 32-34. WU L X, QIN K J, JIANG Z Q, et al. Preliminary experiment on the artificial breeding of the fat greenling Hexagrammos otakii[J]. Marine Sciences, 1996(4): 32-34. 庄虔增, 于鸿仙, 刘岗, 等. 六线鱼苗种生产技术的研究[J]. 中国水产科学, 1999, 6(1): 103-106. 郭文, 于道德, 潘雷, 等. 六线鱼科鱼类特殊体色与繁殖特性[J]. 海洋科学, 2011, 35(12): 132-136. GUO W, YU D D, PAN L, et al. Special coloartion changes and reproductive characteristics of greenlings (family Hexagrammidae)[J]. Marine Science, 2011, 35(12): 132-136. 潘雷, 胡发文, 高凤祥, 等. 大泷六线鱼人工繁殖及育苗技术初步研究[J]. 海洋科学, 2012, 36(12): 39-44. PAN L, HU F W, GAO F X, et al. Study of artificial breeding and seedling culture technique for greenling Hexagrammos otakii[J]. Marine Sciences, 2012, 36(12): 39-44. 胡发文, 潘雷, 高凤祥, 等. 大泷六线鱼胚胎发育及其与水温的关系[J]. 渔业科学进展, 2012, 33(1): 28-33. 高凤祥, 潘雷, 胡发文, 等. 大泷六线鱼的外形特征与消化系统结构[J]. 渔业科学进展, 2012, 33(2): 24-28. 菅玉霞, 潘雷, 胡发文, 等. 温度和盐度对大泷六线鱼仔鱼存活与生长的影响[J]. 渔业科学进展, 2012, 33(5): 24-29. 胡发文, 郭文, 潘雷, 等. 大泷六线鱼仔稚幼鱼形态发育与生长特性[J]. 渔业科学进展, 2012, 33(6): 16-22. 潘雷, 房慧, 张少春, 等. 大泷六线鱼仔、稚、幼鱼期消化酶活力的变化[J]. 渔业科学进展, 2013, 34(3): 54-60. 胡发文, 张少春, 王雪, 等. 大泷六线鱼全人工繁育技术研究[J]. 海洋科学, 2016, 40(3): 71-76. HU F W, ZHANG S C, WANG X, et al. An artificial breeding technique for the fat greenling Hexagrammos otakii[J]. Marine Science, 2016, 40(3): 71-76. 楼允东. 鱼类育种学[M]. 北京: 中国农业出版社, 1999: 3-5. LOU Y D. Fish breeding[M]. Beijing: China Agriculture Press, 1999: 3-5. 张敏莹, 刘凯, 段金荣, 等. 太湖秀丽白虾形态性状对体重影响的通径分析[J]. 中国农学通报, 2010, 26(21): 417-421. ZHANG M Y, LIU K, DUAN J R, et al. Path analysis of effects of morphometric traits on body weight of Exopalaemon modestus in Taihu Lake[J]. Chinese Agricultural Science Bulletin, 2010, 26(21): 417-421. AHMED M, ABBAS G. Growth parameters of the finfish and shellfish juveniles in the tidal waters of Bhanbhore, Korangi Creek and Miani Hor Lagoon[J]. Pakistan Journal of Zoology, 2000, 32(1): 21-26. 栗志民, 刘志刚, 王辉, 等. 企鹅珍珠贝(Pteria penguin)主要经济性状对体重的影响效果分析[J]. 海洋与湖沼, 2011, 42(6): 798-803. LI Z M, LIU Z G, WANG H, et al. Effect of main economic traits on body weight of Pteria penguin[J]. Oceanologia et Limnologia Sinica, 2011, 42(6): 798-803. 张嘉丽, 王庆恒, 邓岳文, 等. 斧文蛤(Meretrix lamarchii)形态性状对体质量的影响效果分析[J]. 渔业科学进展, 2014, 35(6): 110-113. ZHANG J L, WANG Q H, DENG Y W, et al. Effects of morphological traits on the weight of Meretrix lamarchii[J]. Progress in Fishery Sciences, 2014, 35(6): 110-113. 王志铮, 吴一挺, 杨磊, 等. 日本沼虾(Macrobrachium nipponensis)形态性状对体重的影响效应[J]. 海洋与湖沼, 2011, 42(4): 612-618. WANG Z Z, WU Y T, YANG L, et al. Effect of phenotypic and morphometric traits on body weight of Macrobrachium nipponensis[J]. Oceanologia et Limnologia Sinica, 2011, 42(4): 612-618. 刘小林, 吴长功, 张志怀, 等. 凡纳对虾形态性状对体重的影响效果分析[J]. 生态学报, 2004, 24(4): 857-862. 耿绪云, 王雪惠, 孙金生, 等. 中华绒螯蟹(Eriocheir sinensis)一龄幼蟹外部形态性状对体重的影响效果分析[J]. 海洋与湖沼, 2007, 38(1): 49-54. 王凯, 刘海金, 刘永新, 等. 牙鲆形态性状对体重的影响效果分析[J]. 上海水产大学学报, 2008, 17(6): 655-660. WANG K, LIU H J, LIU Y X, et al. Mathematical analysis of effects of morphometric attributions on body weight for Paralichthys olivaceus[J]. Journal of Shanghai Fisheries University, 2008, 17(6): 655-660. 刘峰, 陈琳, 楼宝, 等. 小黄鱼(Pseudosciaena polyactis)形态性状与体质量的相关性及通径分析[J]. 海洋与湖沼, 2016, 47(3): 655-662. LIU F, CHEN L, LOU B, et al. Correlation and path coefficient analysis on body weight and morphometric traits of small yellow croaker Pseudosciaena polyactis[J]. Oceanologia et Limnologia Sinica, 2016, 47(3): 655-662. 董在杰, 梁政远, 徐跑, 等. 尼罗罗非鱼出肉率与可量性状的相关性[J]. 中国水产科学, 2010, 17(2): 212-217. DONG Z J, LIANG Z Y, XU P, et al. Correlation between fillet yield and body measurements in Nile tilapia Oreochromis niloticus[J]. 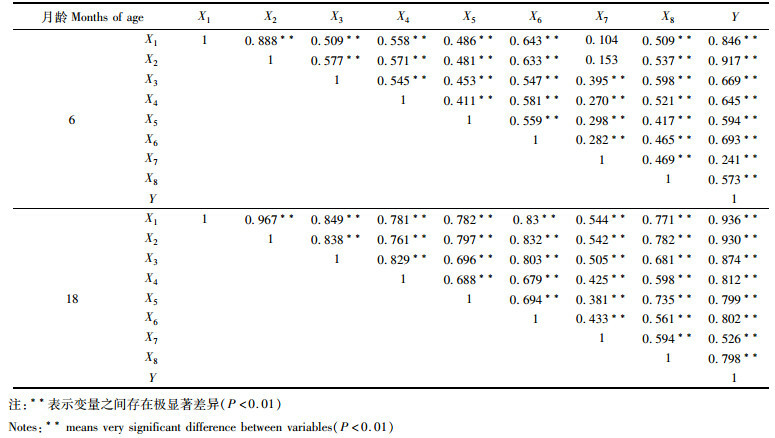 Journal of Fishery Sciences of China, 2010, 17(2): 212-217. 刘春雷, 常玉梅, 梁利群, 等. 转大麻哈鱼生长激素基因鲤表型性状与体质量的相关性及通径分析[J]. 应用生态学报, 2011, 22(7): 1893-1899. LIU C L, CHANG Y M, LIANG L Q, et al. Correlation and path analyses of phenotypic traits and body mass of transgenic carp with growth hormone gene of salmon[J]. Chinese Journal of Applied Ecology, 2011, 22(7): 1893-1899. 朱波, 青长乐, 牟树森. 紫色土外源锌、镉形态的生物有效性[J]. 应用生态学报, 2002, 13(5): 555-558. 刘小林, 常亚青, 相建海, 等. 栉孔扇贝壳尺寸性状对活体重的影响效果分析[J]. 海洋与湖沼, 2002, 33(6): 673-678. 黄建盛, 陈刚, 张健东, 等. 褐点石斑鱼不同月龄形态性状的主成分及通径分析[J]. 水产学报, 2017, 41(7): 1105-1115. HUANG J S, CHEN G, ZHANG J D, et al. Principal component and path analysis of morphological traits of Epinephelus fuscoguttatus at different month ages[J]. Journal of Fisheries of China, 2017, 41(7): 1105-1115. 边力, 刘长琳, 陈四清, 等. 不同生长期圆斑星鲽形态性状对体重影响的通径分析[J]. 中国水产科学, 2017, 24(6): 1168-1175. BIAN L, LIU C L, CHEN S Q, et al. Path analysis of effects of morphometric traits on body weight in spotted halibut Verasper variegatus at different growth stages[J]. Journal of Fishery Sciences of China, 2017, 24(6): 1168-1175. 刘贤德, 蔡明夷, 王志勇, 等. 不同生长时期大黄鱼形态性状与体重的相关性分析[J]. 热带海洋学报, 2010, 29(5): 159-163. 韩慧宗, 姜海滨, 王斐, 等. 许氏平鲉不同月龄选育群体形态性状的主成分与通径分析[J]. 水产学报, 2016, 40(8): 1163-1172. HAN H Z, JIANG H B, WANG F, et al. Principal component and path analysis of morphological traits of selective groups at different month ages of Sebastes schlegeli[J]. Journal of Fisheries of China, 2016, 40(8): 1163-1172. 王标, 虞木奎, 孙海菁, 等. 盐胁迫对不同种源麻栎叶片光合特征的影响[J]. 应用生态学报, 2009, 20(8): 1817-1824. WANG B, YU M K, SUN H J, et al. Photosynthetic characters of Quercus acutissima from different provenances under effects of salt stress[J]. Chinese Journal of Applied Ecology, 2009, 20(8): 1817-1824. 何小燕, 刘小林, 白俊杰, 等. 大口黑鲈形态性状对体重的影响效果分析[J]. 水产学报, 2009, 33(4): 597-603. HE X Y, LIU X L, BAI J J, et al. Mathematical analysis of effects of morphometric attribute on body weight of largemouth bass (Micropterus salmoides)[J]. Journal of Fisheries of China, 2009, 33(4): 597-603. 区又君, 吉磊, 李加儿, 等. 卵形鲳鲹不同月龄选育群体主要形态性状与体质量的相关性分析[J]. 水产学报, 2013, 37(7): 961-969. OU Y J, JI L, LI J E, et al. Correlation analysis of major morphometric traits and body weight of selective group at different month ages of Trachinotus ovatus[J]. 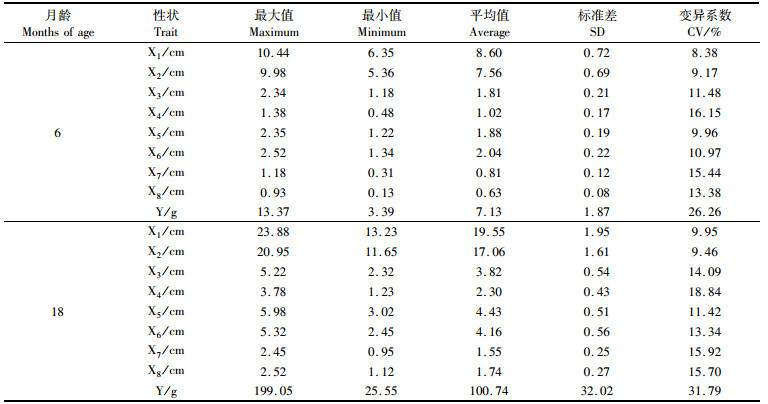 Journal of Fisheries of China, 2013, 37(7): 961-969. 刘峰, 楼宝, 陈睿毅, 等. 鮸形态性状与体质量的关系[J]. 应用生态学报, 2016, 27(12): 4059-4066. LIU F, LOU B, CHEN R Y, et al. Relationship between morphological traits and body mass of Miichthys miiuy[J]. Chinese Journal of Applied Ecology, 2016, 27(12): 4059-4066. Abstract: In order to research the relationship between the morphological traits and body mass of Hexagrammos otakii, 150 tails of six-month and eighteen-month Hexagrammos otakii were randomly sampled for measuring body, mass and eight morphological traits including full length, body length, body height, body width, head length, trunk length, length of tail stalk, height of tail stalk, and correlation analysis, regression analysis and path analysis were used to study the eight morphological traits on the impact of the body mass.A significant positive correlation between morphological traits and body mass of six and eighteen months of Hexagrammos otakii were observed, with extreme significance(P < 0.01), and the main morphological traits of body mass affected by different age of month were different. Six-month and eighteen-month Hexagrammos otakii were selected for the four morphological traits of body length, head length, body height, body width and full length, body height, height of tail stalk and body width by gradual introduction and gradual elimination method and the multiple regression equations were established:Y=-13.54+1.905X2+1.222X3+1.211X4+1.499X5, Y=-173.415+8.85X1+11.18X3+9.65X4+20.749X8. The results of path analysis showed that the morphological traits with the greatest direct effect on body mass of the 6-month-old and 18-month-old greenling were body length (0.706) and full length (0.538), respectively, and body length, head length, full length and body height had a decisive effect on the body mass of greenling at 6 months and 18 months.In addition to the morphological traits of the above, it should be combined with body width for breeding. The results of the study could provide important reference for the use of the morphological traits of Hexagrammos otakii for breeding.